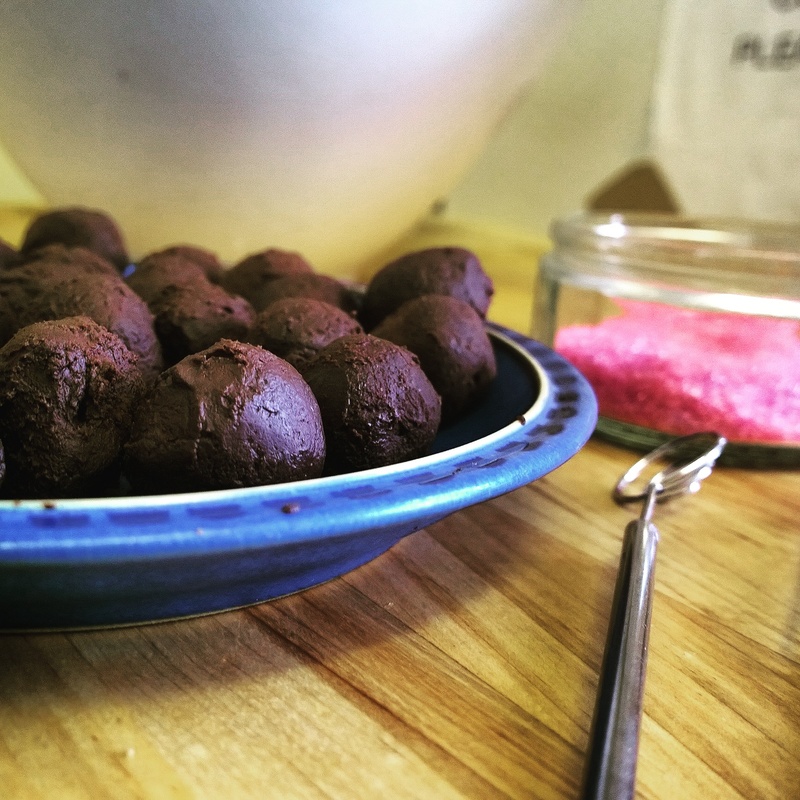 This truffle recipe came about when I needed something edible to take to a dinner party. Eating requirements included gluten-free, dairy-free and vegan. I found a recipe online and, although it was going in the right direction, the texture wasn’t right. The truffles were too soft. Also, presumably due to the wetness, they absorbed the recommended coating of icing sugar or cocoa powder. To me adding ground almonds seemed like the obvious answer. And it worked! My dad absolutely loves these truffles. He has no special eating requirements whatsoever but he was pretty much ready for me to pack in my degree and my jewellery business to concentrate purely on making these wee goodies to sell when he first tasted them. Pretty sure the first time he ate them I hadn’t made my own recipe yet so they were still a bit sticky as well! Anyway, I made some of these beauties to decorate the top of my Mum’s birthday cake this year. She doesn’t have any eating requirements either so I dipped hers in white chocolate to ensure that they stood out on top of the dark chocolate ganache. A wee sprinkle of pink sugar made them fit for a princess. Or rather my dad, who stole one (or 3) at every available opportunity. Due to my Dad’s particular enjoyment of them I have made some special ones this week to post home for Father’s Day. 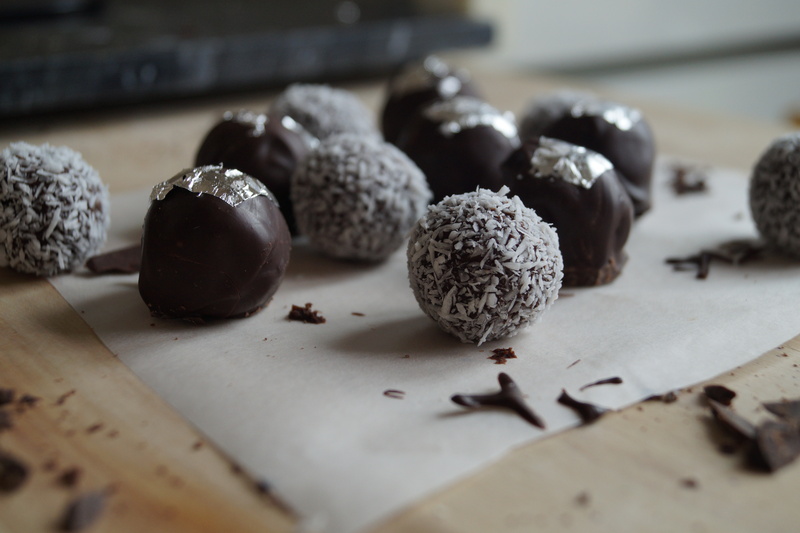 The photo below shows vanilla and coconut truffles and the ones with edible silver leaf are cherry and almond. 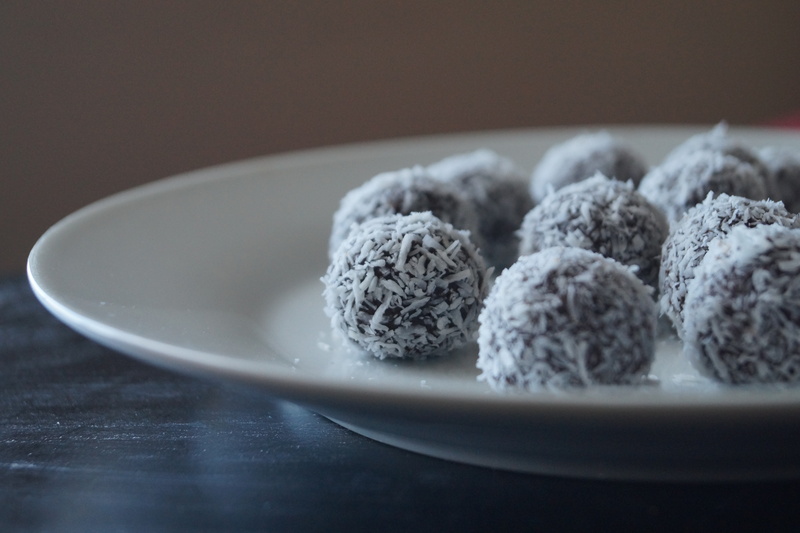 These truffles are wonderful both dipped in (yet more) chocolate or simply rolled in desiccated coconut or chopped flaked almonds. You can also hide things in the middle if you like, such as nuts or dried or boozey fruit. My latest batch have almond essence in the mix and a stoned alcoholic cherry in the centre, to get a grown up bakewell flavour. We have a beautiful friend in Arbanija, Ciovo who gives us some when we holiday there in the summer. I am not suggesting that you find a lovely Croatian lady to supply you with brandy soaked cherries, that might be a bit costly. However, Kirsch soaked cherries are available in supermarkets if you want to use something similar. Glacé cherries would be nice too. 1. Melt chocolate in a heatproof bowl over a pot of gently simmering water. 2. Once fully melted add the coconut milk and mix well. It will look like it is curdling but as you continue to stir you will get a beautiful smooth, glossy brown mixture. 3. Add the ground almonds and your choice of flavouring. 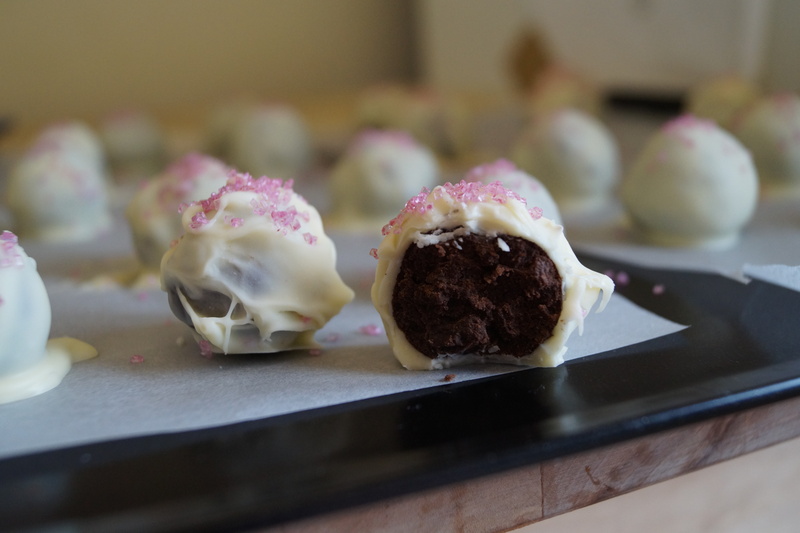 If you want plain chocolate truffles you don’t need to add any flavouring. Mix well. 4. Put the bowl in the fridge and leave for at least 2 hours. Then you can ball up the mixture. This recipe should make about 25 truffles. Use a teaspoon to scrape some mixture out. Use the warmth of your hands to roll the mixture into a ball. Yes, you will get sticky. Very sticky. 5. Roll the balls in coconut or flaked almonds and place in an airtight container and return to fridge. If you plan to dip the truffles I would recommend refrigerating them before attempting to do so. 6. If dipping them put 2/3 of the dipping chocolate into a heatproof bowl over a pot of gently simmering water. Once the chocolate has melted remove the bowl from the heat and add the remaining third of chocolate and stir til this is also dissolved. Then wrap a clean tea towel around the bowl and allow it cool down to 31-32˚c, as recommended in Sweets Made Simple by Miss Hope and Mr Greenwood of the BBC 2 show of the same name. If you don’t have a thermometer leave for about 40 minutes. Line a baking tray with greaseproof paper. 7. Once the melted chocolate is ready to use dip the balled truffles into it one at a time and stir them gently to ensure even coverage. Place the dipped truffles onto the lined tray. If you are doing different flavours you can use sprinkles/coloured sugar/flaked almonds/coconut to distinguish between them. Sprinkle these on now. If you wish to add gold or silver leaf leave that til after the coating has set fully. Repeat until completed. As a general rule my dipped ones look less shop-bought perfect than my rolled, but that may just be because I am not used to handling chocolate. Either way the truffles look beautifully artisan. Put in the fridge for a few hours to let the chocolate set again. These will keep in an airtight container for a few days. I like to keep mine in the fridge as they are gorgeous chilled. 8. Optional final step-take a photo and tag it #amysbakes on Twitter or Instagram so I can see your treats! Since university has finished for the summer I have been spending a lot of time in my tiny wee kitchen. My boyfriend’s family have many an allergy, and adjusting to these can threaten the success of a bake. This leads me to experiment whenever I get the chance. I am really enjoying using ripe banana for recipes other than the mandatory banana bread. Not that I am knocking banana bread, but if you forgot about your bananas as often as I do you would be fed up with it too. Line 9 holes in a cupcake tray. I use cupcake cases in a muffin tray but you can use whatever you have. The size and final quantity of little cakes may vary a wee bit. Preheat oven to 200˚ normal oven, 180˚ fan oven or gas mark 6. Beat margarine and sugar until light and fluffy and very pale in colour. This stage is particularly important in the vegan cupcakes as the air that gets beaten in ensures that the sponge is light rather than heavy, like regular banana bread. Add the mashed banana and mix. 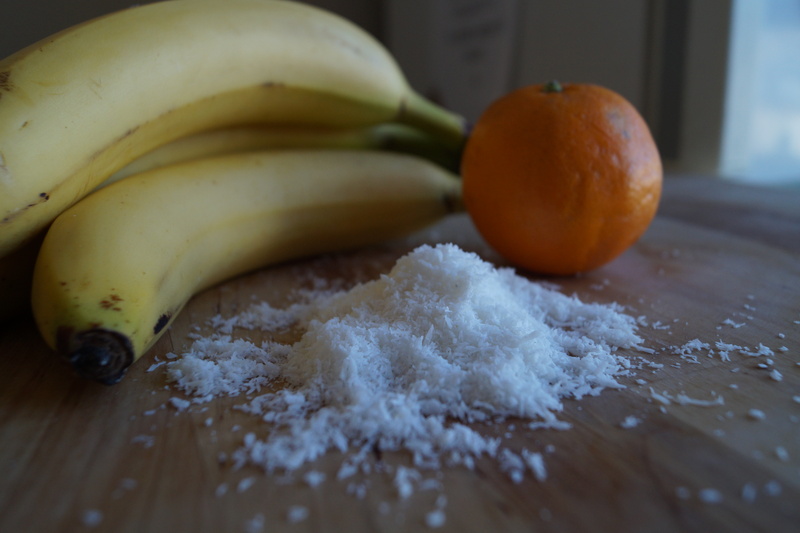 Then fold in flour, coconut and orange zest. Spoon your mixture into each of the cases. Add a little at a time to each to make sure you don’t end up with one mega cake and a hoard of mini ones (yes, speaking from experience!). Bake for about 20mins. When cooked the cakes should spring back from a very gentle prod or a skewer inserted into the centre of one should come out clean. Allow to cool in tray for 10 minutes then move to a wire rack to cool fully. They are very yummy at this warm stage. Go on try one, no one else will know there is one (or 4) missing. 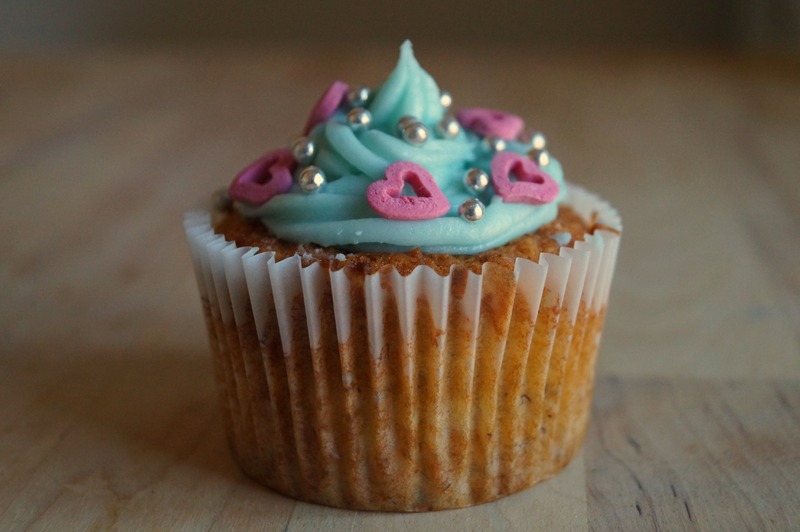 Add your favourite icing and decoration! I used Poundland’s vanilla icing. Cheeky I know but the consistency is really good for a vegan icing and the flavour is rather nice too. Icing in my photos is blue as I have been practicing for someone’s birthday, but please do not feel that this is necessary! 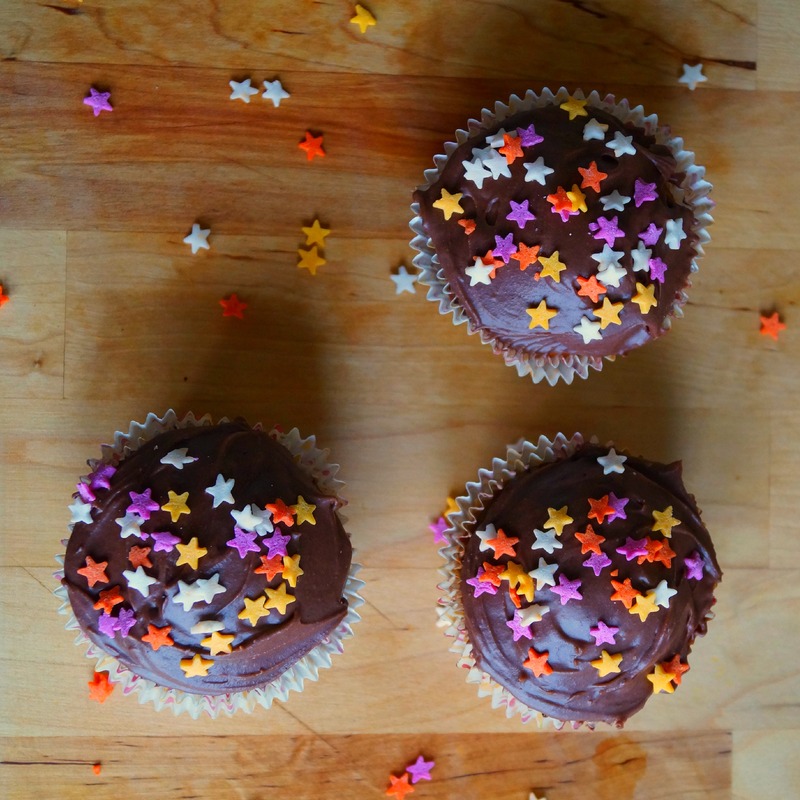 Optional last step, take a photo and Instagram or tweet it using the tag #amysbakes so I can see your lovely munchies. I promise I won’t burble for long but if you just want the recipe feel free to scroll right to the bottom! So my mum and I have been creating different variations of this madeira recipe for as long as I can remember. Well, I say that. Back when I was wee I did a little stirring and mostly just licked the bowl and spoons at inopportune moments. This chocolate orange marble madeira sponge recipe is one of my own. They generally look fab on their own, with no additional decor and fuss, due to their awesome swirls. However, sometimes some fuss is required. The photo below is of these cupcakes all dressed up and ready to party. The butterflies are edible laser cut rice paper that I found on EBay. They can also be made to look fun and a bit messy, other people will feel less threatened by your baking prowess if you take the following route. Preheat oven to 170˚C fan oven, 190˚C regular. Place 12 paper cases into your 12 hole tray, if you want your cases to be able to stand up to high scrutiny you can put two cases in each hole. This means that the inner one takes the grease and the outer looks lovely. It also makes the marbling a bit easier. I use a muffin tray with regular size cupcake cases, I like the way the sides are very straight but just use whatever you have. Combine everything EXCEPT the cocoa powder and orange zest. Split the mixture as evenly as you can into two bowls. Sift cocoa powder into one bowl and mix. Add orange zest to the other bowl and mix. You should now have two magnificent smelling mixtures, one brown and one cream. Spoon about a heaped teaspoon (easier to use an actual cup of tea-making teaspoon than a measuring teaspoon spoon) of each mixture into all 12 cases. If you have mixture left over having done so, continue to split mixture between cases until you are all out of cake mix. Now for the fun/tricky bit. Marbling big cakes is fun and straightforward. 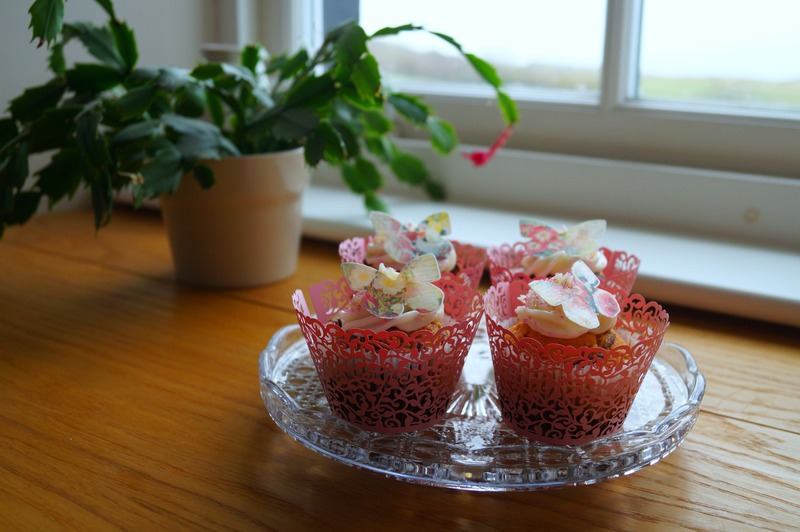 Marbling cupcakes is trickier as the swirling movement can pull the cases away from the tin leaving you with a rumpled edge. If you have double cupcake cased your tray this is easier to rectify as only the inner case rumples and when you push it back to the edges of the tin to straighten it up the inner case slots back into the undisturbed outer case. Grab a skewer, cocktail stick or fork. With your thumb and forefinger press down slightly on the rim of your cupcake cases whilst you swirl your mixture. Don’t overdo it now! You want a beautiful marble effect, not a solid light brown colour. Pop these bad boys in the oven and bake for about 20 mins. Keep an eye on them as cooking time will vary between cupcake sizes and the age of your oven. The cakes should spring back when gently prodded with your finger. If you are unsure use your skewer from earlier (having washed it!) and insert into the centre of one of your cakes. It should come out clean. When cooked allow cupcakes to cool in their tray for a few minutes before turning out to cool on a wire rack. They are very tasty as this stage but no good for icing, so try to be patient. Don’t ice when they are even the slightest bit warm still or you could watch all your hard work splurge everywhere into a soggy mess. Believe me, I know.Optional last step: take a pic and Instagram or Twitter it using #amysbakes so I can see your awesome results! Optional last step: take a pic and Instagram or Twitter it using #amysbakes so I can see your awesome results! I am leaving it to you to decide whether to ice or simply sprinkle with icing sugar or cocoa powder. As I said earlier due to the marbling they look lovely uncovered. One tip I will give is that Poundland’s Jane Asher baking range do vanilla frosting which just so happens to be vegan and pipes beautifully. Happy days!